I've had a hard time creating healthy meals lately. I love eating fresh healthy meals because I feel great afterward but with 7 days in a week (and three meals a day) the process can be daunting. Not only am I spending time making these culinary creations but planning each meal out seems like a full-time job. For this recipe, I wanted something fresh with minimal ingredients that I could throw together quickly and eat for multiple lunches. If I am going to spend the time putting something together you better believe I am going to want to eat this for more than one meal. 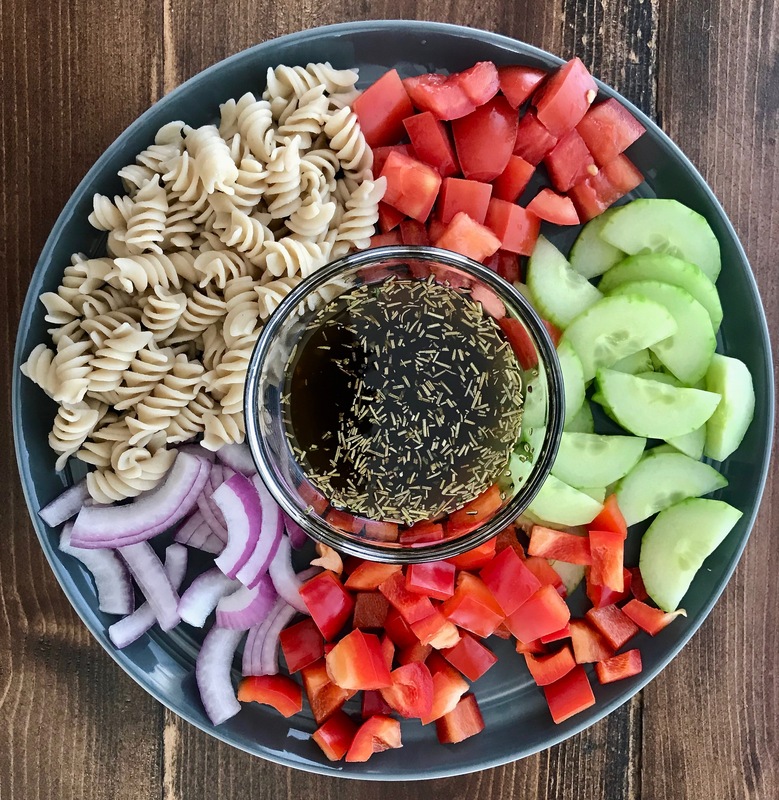 I know Italian Pasta Salad is not a new and crazy discovery, however, the key to this pasta salad is in the dressing. I am not a big fan of buying mixed dressings at the store because of the added ingredients that I don't care for (the biggest being sugar, eggs, and dairy) so I created my own super simple dressing with olive oil, wine, vinegar, our new dipping spices, and a little it of our Aged Balsamic Vinegar for depth and sweetness. (1) Make sure you leave time for the dressing to soak. In order to really appreciate all of the spices in our Organic Tuscany Bread Dipping Spices you need at least 20 minutes to let it sit and all meld together. (2) You can use whatever pasta you would like but I stick to gluten-free kinds of pasta that have minimal ingredients. In this case, I chose Trader Joe's organic brown rice and quinoa fusilli pasta. It has a great texture, taste, and a good amount of protein. I add in a little bit of salt, garlic, black pepper, and onion powder (my go-to spices) when I boil this pasta to give it a little more flavor. (3) Drizzle the Balsamic Vinegar at the end and mix up well. As with any olive oil and vinegar, you are going to get separation when mixing them together. Since our Aged Balsamic has such a thicker consistency than wine vinegar, we recommend adding it last to your pasta creation. *If you plan on eating this for multiple meals like I typically do make sure to take out of the fridge a few minutes before you would like to enjoy since olive oil tends to solidify at cold temperatures. Combine olive oil with white wine vinegar (red wine vinegar would work as well) and the Tuscany Dipping Seasoning. Let this mixture sit out at room temperature for at least 20 minutes. Cook your pasta of choice according to directions. I used Trader Joe's organic brown rice and quinoa fusilli pasta for a gluten-free lighter option. Once pasta is cooked, drain and hit it with cold water to stop the cooking. Combine the pasta with your chopped cucumber, tomato, red onion, and red bell pepper. Pour in your dressing and mix well. Taste test to see if you need any more salt or pepper and add additional spices in small increments. A good tip to keep the salt content low is to add in lemon juice as opposed to extra salt. Drizzle the Balsamic Vinegar, mix well and enjoy!